Welcome to the Ultimate Car Wash and Detailing Center! At the Ultimate we've made getting the car washed quick and easy with professional results. While we offer Exterior Express, we are every bit a Full Service Car Wash! We offer free self-serve high-powered vacuums but will give your car the white-glove treatment! We know how busy life can be for families, so at the Ultimate you'll find we've combined choice and flexibililty with new technology and offer our customers an eco-friendly, state-of-the-art, second-to-none car wash and detailing center that will add life, sparkle and value to your vehicle, today! While attendants are on duty at all times to assist customers, our drive-thru panels make it easy for you to choose the perfect car wash! Offering a very wide range of options for interior and exterior washes, with several standard packages and a la carte services. You can always get exactly what you want from a service and budget perspective! No appointment detailing! From waxing, seat and carpet services to even wheel and engine services. All at an affordable price with fast, no wait service! HIgh-end full detailing solutions. Full interior, exterior, engine, tire services to completely rejuvenate your automobile. Expert technology and products will bring your car back to the way it should look! Want to give the gift of a clean car? Ask us about our gift cards for both washes and detailing services. From a one time visit to pre-paid multiple wash cards, give the gift of clean. Family owned and run. Not losing site of the personal touch our customers expect and need. "People are hanging on to their cars longer and taking better care of them. Keeping them clean is part of that." The Martineaus love dirty cars. The more the better, especially if they are getting scrubbed down at their car wash in Antioch. 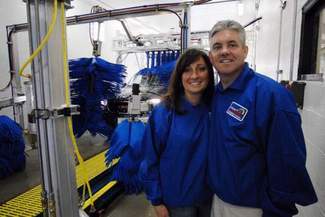 The Grayslake couple opened the Ultimate Car Wash and Detailing Center in 2009. The business is on Route 173 in front of Menard's. The car wash is different from many, because its 100-foot-long tunnel is more than twice the length of more-typical car washes, Martineau said. "Our system is packed with sophisticated cleaning equipment," he said. "Other car washes try to do the same job in a short tunnel but can't get the same quality results." While some people might question the wisdom of starting a business in the face of a severe recession, Martineau, says he's feeling confident going forward. "We have a lot of things in our favor," he said. "A car is a person's second biggest investment. And because of the times, people are hanging on to their cars longer and taking better care of them. Keeping them clean is part of that." The business will employ more than 15 people. Blair Martineau said opening the business in 2009 was much better than when gas prices were skyrocketing. "Car washes were really having a hard time when gas was four bucks a gallon," he said. "If you are dropping $100 in your tank, you don't want to add the price of a wash. We're about half that now. I think we're good." Nothing is more important. We pride ourselves in providing the best service all the time. Utilizing the best products and technology and keeping up with new solutions. You will receive the best cleaning guaranteed. Our staff is an extension of us. We hire only the best staff that can give you the best experience you can possibly have. Offering everything from a quick low-cost wash to a very thorough detail provides customers exactly what they need when they need it.